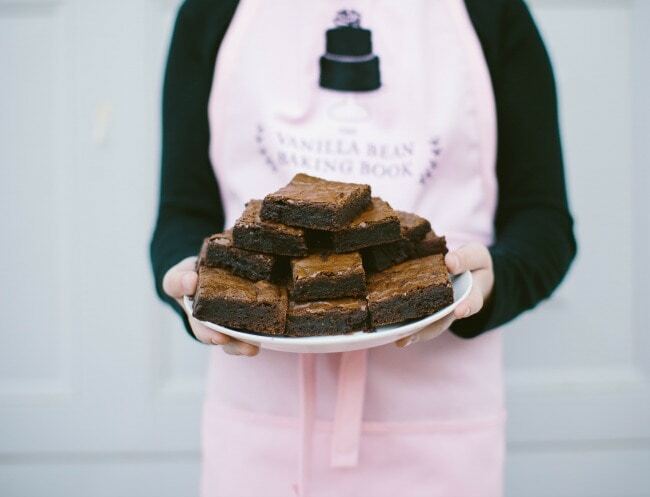 I have two exciting things to share with you: this giveaway, for a Vanilla Bean Baking Book apron and tea towel, and a recipe for my favorite brownies found in my cookbook. Yah! 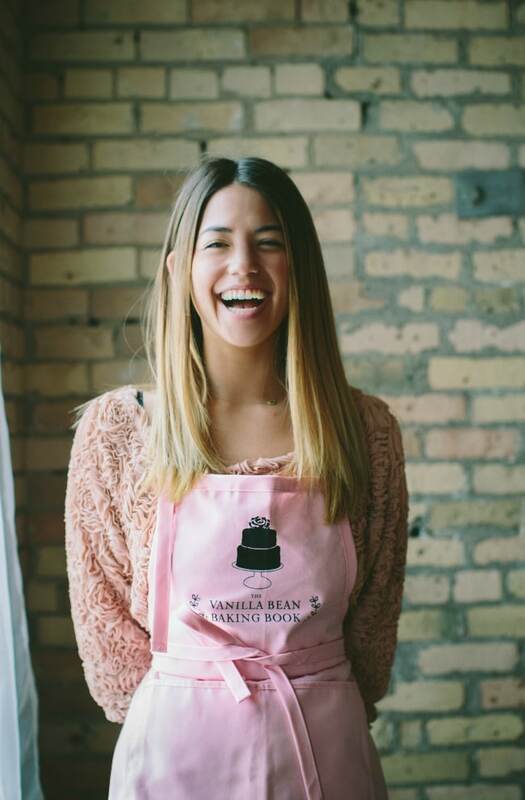 I had some lovely help with these photos; my daughter above, and Ms. Molly Yeh, Melissa Coleman, and Zoe Francois. 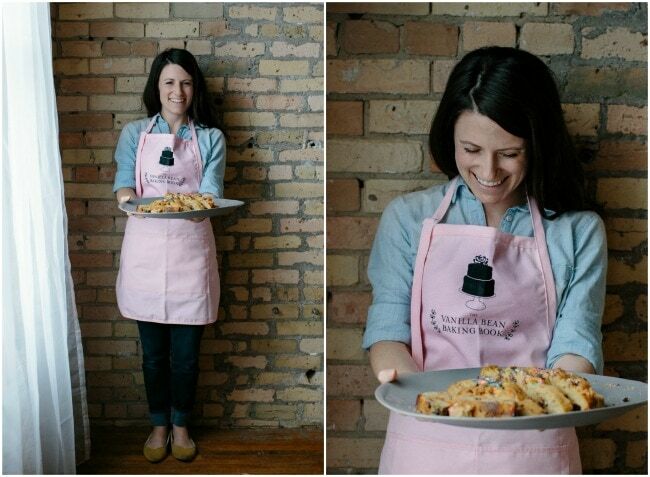 I got to hang out with them this weekend at Pinch of Yum’s amazing studio to celebrate Molly’s new book, and they were kind enough to let me take a picture of them in my pretty pink apron. 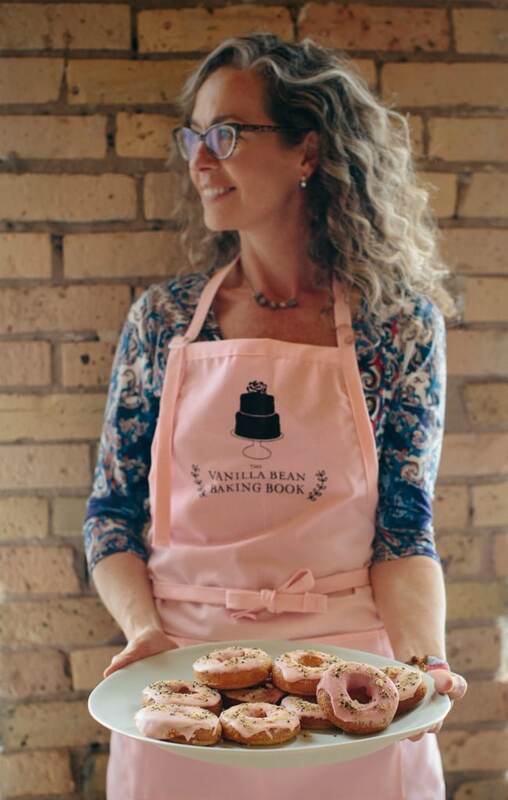 To Enter: Pre-order THE VANILLA BEAN BAKING BOOK and enter for a chance to win an apron and tea towel designed to go with the book! 12 winners will receive these lovely and practical (I had to make sure that the aprons have pockets!) kitchen items. Everyone who has pre-ordered my cookbook previously or places an order through Wednesday November 6th is eligible to participate. (Sorry, US and Canada only!) Simply go to this google form here and fill it out. Extra Entries: Share my photo about the giveaway on Instagram to receive an extra entry! 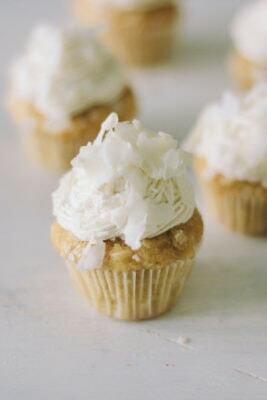 Make sure to use the hashtags #vanillabeanbakingbook and #vanillabeangiveaway to help me track all entries. Thanks! And now, brownies. I have three favorite brownie recipes: Ina Garten’s outrageous brownies, the famous Baked brownies, and one I have on my site, from America’s Test Kitchen. I wanted a recipe that sort of combined the best elements of each of them. That meant good chocolate flavor, the perfect balance between cakey and fudgy, and a slightly chewy texture (a nod to the boxed brownies of my youth) were all on my list. After six months of testing and tweaking this recipe, I finally baked a perfect pan of brownies. I know brownies are subjective. Everyone has their own way of loving them, and you may not agree with me on texture here. I understand, we’re all unique individuals. But every time I eat these, I nod my head with a smile, confident that my search for perfection is over. Adjust an oven rack to the lower middle position. Preheat the oven to 350°F. 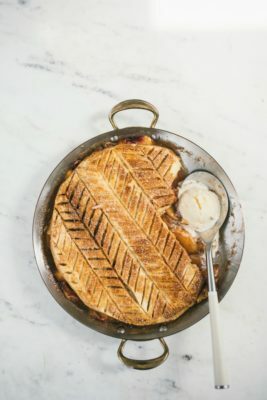 Grease a 9 by 13-inch baking pan and line a parchment sling. In a medium saucepan over medium-low heat, melt the butter and the bittersweet chocolate until both are melted and smooth. Remove from the heat and add the cocoa powder, stirring until smooth. Set aside to cool slightly. In a large bowl, whisk the eggs, oil, sugars, and vanilla. Add the slightly cooled chocolate mixture and whisk until smooth. Add the flour mixture and stir with a spatula until just combined. 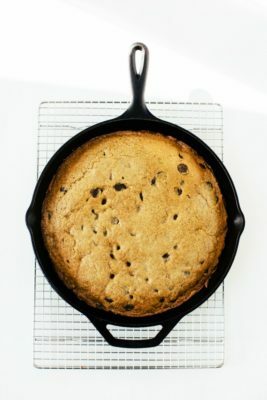 Pour the batter into the prepared pan and bake 22 to 27 minutes, until the sides of the brownies have set, the top is beginning to crackle and look glossy, and a wooden skewer or toothpick inserted into the center comes out with crumbs. The batter on the skewer should not be wet, but should have a good amount of crumbs clinging to it. Transfer the pan to a wire rack and let cool completely. Use the parchment paper sling to gently lift the brownies from the pan. Cut them into squares. 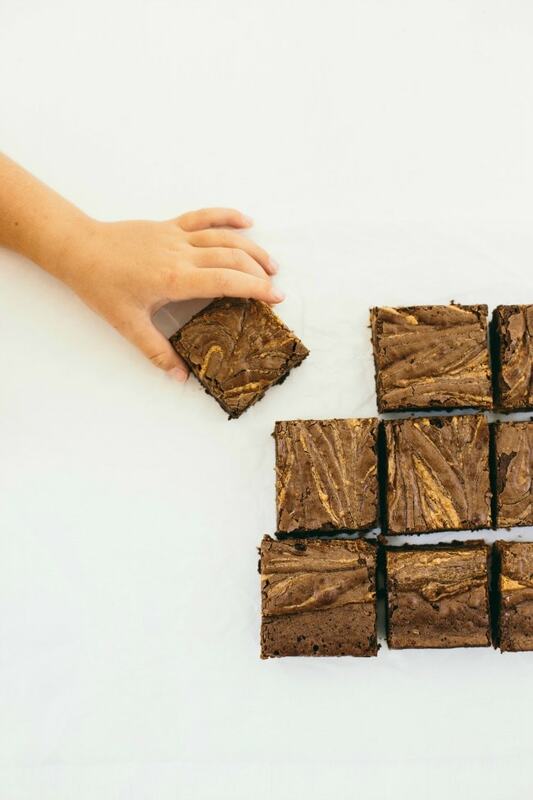 peanut butter brownies • Take ¾ cup of creamy peanut butter and drop it in circles over the brownie batter before baking. 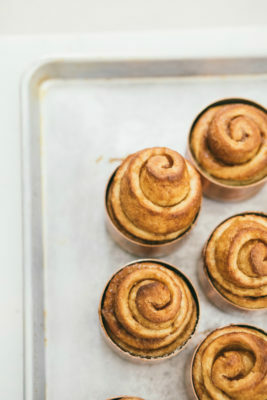 Using an offset spatula or butter knife, drag the peanut butter through the top of the batter, making swirls. Bake as directed. PS The doughnuts that Zoe is holding (pictured above) are dukkah donuts with blood orange glaze from Molly’s new book, and they were amazing. 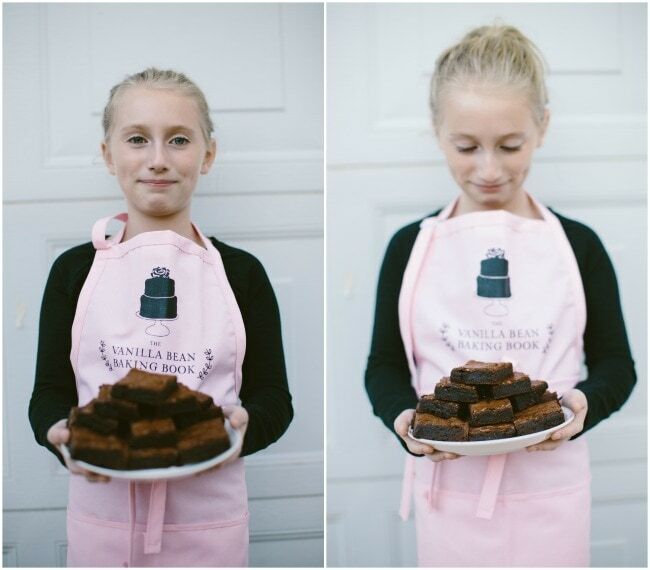 The brownies look decadent and the apron is delightful. Do you have a no purchase entry? Brownies are probably one of my favorite desserts and these look delicious! Your Book will be fabulous! I made these on Sunday and they are absolutely the best brownies I’ve ever eaten in my life. They are SO GOOD! I can’t wait to make them again. 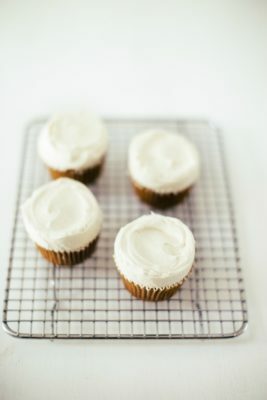 I made these with dark brown sugar because I didn’t have any light brown on hand…but definitely need to remake with light brown! The dark brown sugar really competes with the chocolate flavor. Otherwise amazing texture!! Excited to try these again. Hi Sarah, these brownies look gorgeous, I’d love to make these. I have a question though, can I bake them in a 8*8 square pan coz I don’t have a 9*13 pan. I’ve made these a couple times now and my 27 year old daughter says, “These are the best brownies I’ve had in my life!” She’s a chocolate lover and these are terrific! Most recently, I tried freezing them, then cutting in half and using for an ice cream sandwich. They work extremely well, hold together (cut them frozen) and maintain a great texture and taste frozen. So good!! !